This reaction may have owed to a very early morning flight and a slow awakening; nonetheless, as I stepped out onto the hot tarmac at Seymour Airport on Baltra Island I believed that maybe I had actually landed on another planet. Before embarking on my Galápagos voyage, I had done the background research, familiarized myself with the flora and fauna, and even watched the David Attenborough movies to better understand life on the islands in realtime. But no amount of study could have prepared me for the absolute magic that the Galápagos Islands hold. 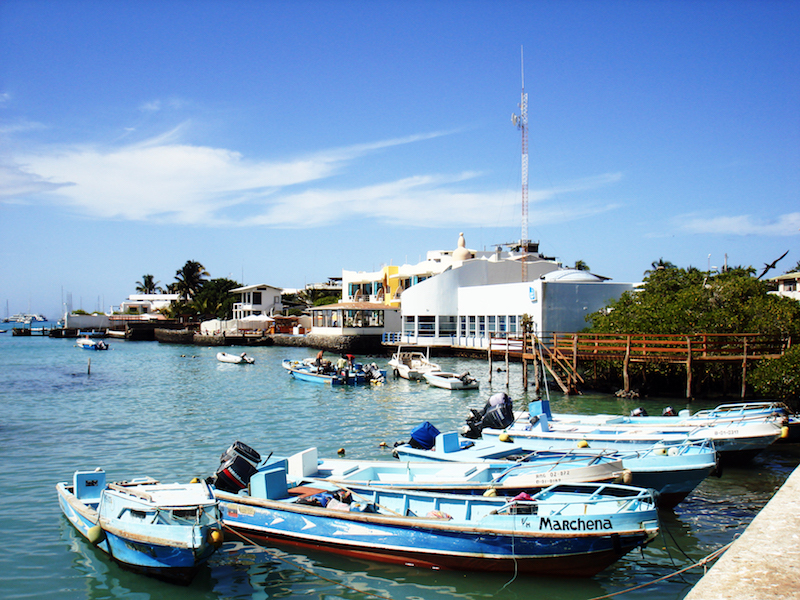 Part of Ecuador, the Galápagos Islands are an archipelago that sit along the equator approximately 600 miles west of the mainland. 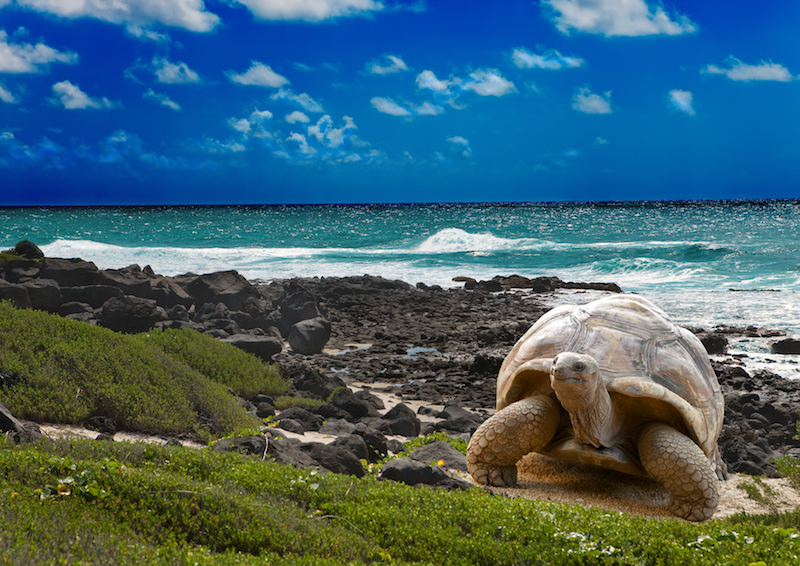 The Islands were formerly a refuge for pirates hoping to plunder gold and silver carried by ships from South America back to Spain, and were fittingly named after the thousands of giant tortoises that once roamed them, as tortoise translates in Spanish to galápago. The islands were made famous in 1835 following a visit from naturalist Charles Darwin, whose study of wildlife on the islands featured heavily in his development of the theory of natural selection. As I was whisked away from the airport and onto the ferry to the mainland of Santa Cruz, I could not believe my eyes. Simply staring off into the sea offered a plethora of magnificent hues of blues and aquamarines, the colors so vivid I felt as if there were an assault on my senses, as though it couldn’t possibly be real. Multicolored crabs could be seen holding onto black lava rocks basking in the sun. The water was so clear you could see small schools of fish flittering through the current in unison. By the time I reached Santa Cruz, I was in awe of the seemingly endless and untouched vegetation, so lush and green as far as the eye could see. And just as I was taking all of this in with splendor, my driver suddenly pulled over our car and exclaimed “galápago!” To my astonishment, there snacking on the flourishing landscape without a care in the world, were the first giant tortoises I had ever seen. The size and magnitude of these reptiles in person is unbelievable. With some weighing up to 600 lb, four feet in length and living for 100 years on average, the giant tortoise truly is an evolutionary feast for the eyes. Following the tortoise pit stop, we carried on driving around the island, through Puerto Ayora, the largest town in the Galápagos Islands, and onto my place of residence for the next few days, Pikaia Lodge. I had seen the photos and researched the property I would be staying at, however, as we pulled up towards the hotel, I felt like I was entering a James Bond film in the role of a Bond Girl—damsel in distress on her way to the villain’s headquarters. An architectural masterpiece, this ecofriendly accommodation astounds all those who enter its gates. Boasting arguably the best views in Santa Cruz, its own private yacht for excursions, contemporary but environmental designs and fabulous food, Pikaia Lodge impresses. After being blown away by Pikaia, I set off for a boat tour of the islands. Following my explorations on the mainland, I was fortunate enough to join an island cruise aboard the MV Eclipse. 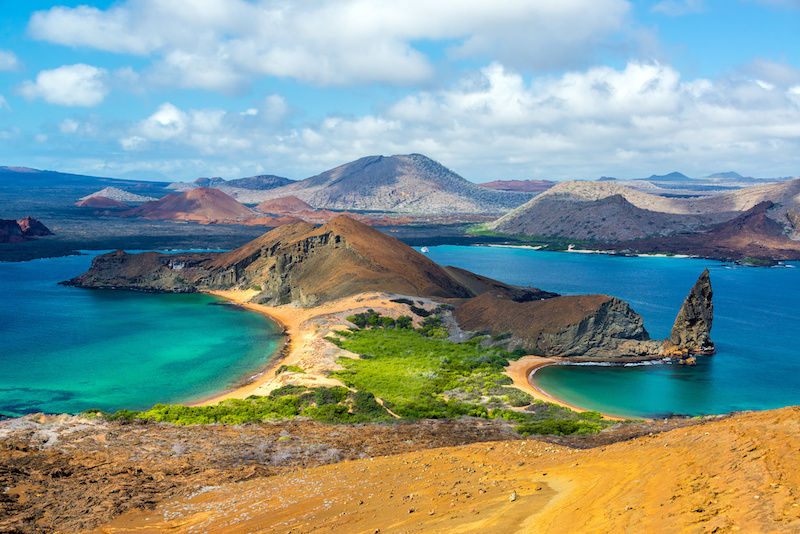 Cruises in the Galápagos allow travelers to see more distant islands like Fernandina or Isabela, as passengers sail overnight and wake up in a new destination, ready to explore. My time aboard the Eclipse was just that—an exploration. Every day was a new island, bay or cove, an adventure and a learning experience. Naturalists will take small groups of 8-12 passengers on various activities such as snorkeling, walking/hiking, kayaking and panga (zodiac boat) rides over the course of the day. There is always something to see and do, and travelers are never bored. In fact, you are so engaged in all of the different environments, vegetation and wildlife each day that you welcome the opportunity for an afternoon siesta on the ship’s sun deck. 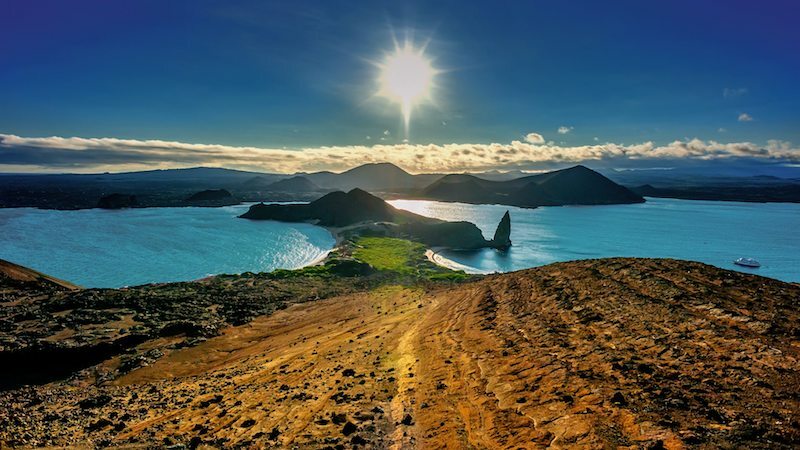 San Cristóbal, meanwhile, features thundering mountains built up by years of volcanic ash on one side of the island, and the most picture-perfect, sea lionclad beaches on the opposite side. There are islands like Floreana, whose waters are so crystal clear that you can see sharks, sea turtles and rays swimming in the bay from atop the Baroness’s lookout, and later snorkel with playful groups of sea lions at Post Office Bay. 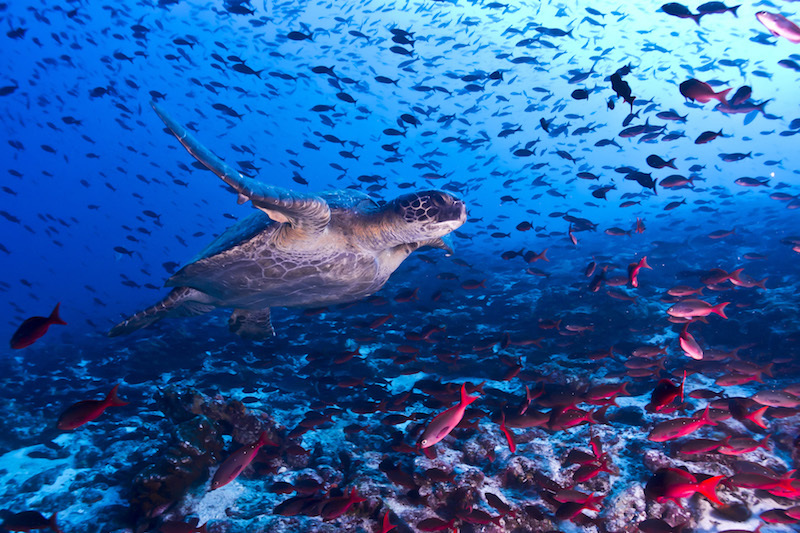 With an animal population that attracted no less an authority than Charles Darwin, the Galapagos Islands are among the world’s most exotic wildlife playgrounds. And because the majority of Galapagos animals are not native to the islands (most species originally floated to the island on logs or plant beds), the resulting population is as diverse as it is fascinating. Their distinctly colored appendages are for more than great photo ops. In an elaborate mating ritual, males display their feet by lifting them up and down while strutting before the female. It’s an impressive ritual, but I can tell you from personal experience (and my wife can corroborate) that it’s less successful for human males. Galapagos land iguanas belong to a genus known as conolophus, which is Greek for “spiny crest.” (One look at the picture at left and you can probably guess why.) Visually the iguanas are something to behold, but don’t tell that to Darwin, who called them “ugly animals,” before elaborating, “from their low facial angle they have a singularly stupid appearance.” Not cool, Darwin. Not cool. They may be named after lions, but these guys probably have more in common with your family dog than the king of the jungle. Known as the islands’ “welcoming party,” sea lions can often be found sunbathing on the shore (though I sometimes worry they’re not using enough SPF) and have a playful nature that makes them a hit with travelers. If you haven’t seen them in person, believe me: “giant” is an apt name for these behemoths, which can weigh nearly 900 lb and reach lengths of 5’9″! Their historical importance looms perhaps even larger: Darwin’s observation of differences between highland and lowland species helped him develop his theory of evolution. The bestdressed bird in the biz isn’t exclusive to arctic climates. 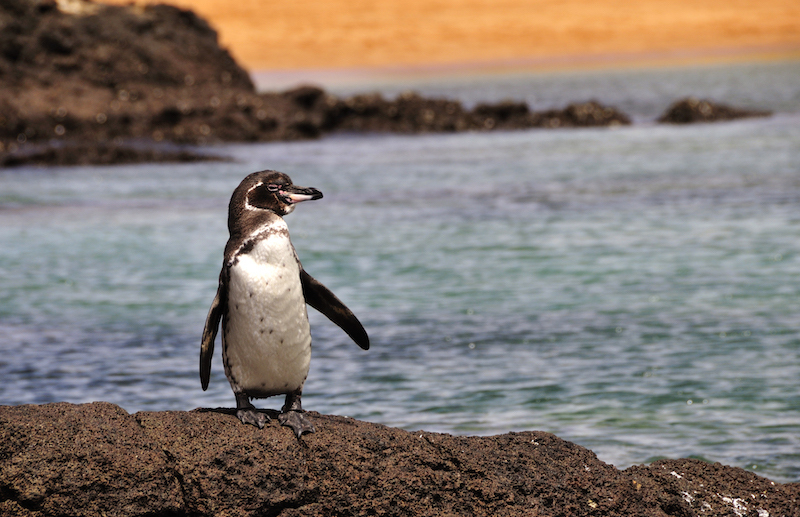 A cousin of South Africa’s banded penguins, Galapagos penguins are the only breed to live above the equator. They’re able to survive there thanks to the cool temperatures brought in by ocean currents.